Extended over an area of 430 sq. kms, along the mighty Brahmaputra, Kaziranga National Park holds a number of species such as the One-Horned Rhino, Indian Bison, Sloth Bear, leopard cat, Tiger, Elephant, Samber, Hog Deer, Jungle cat, Hog badger, Heron fishing eagle, Capped langur, Jackal, Goose, Hornbills, Ibis, Cormorants, Hollock gibbon, Swamp Deer Egret, etc. 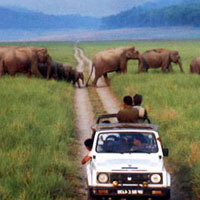 The wildlife can be enjoyed all the more with the help of jeep safari and elephant safari. By Air: Guwahati airport-217 kms & Jorhat airport-97 kms. By Railways: Furkating is the nearest railway station. 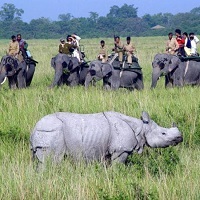 Wild Grass Lodge, Bonhabi Resort, Kaliabor Manor Resort, Kaziranga Resort and Aranya resort.